My first concert was supposed to be Roxy Music with Modern English on Saturday May 28th, 1983. I was 17, about to graduate high school and, as I’ve written before, somewhat of a music-obsessed geek. Two friends and I had tickets for the show, and all systems were a go despite a last-minute change in venue (due, I believe, to poor ticket sales) from the Spectrum in South Philly to the Tower Theater in Upper Darby. One of those same friends came to me the week of the 16th: Would I like to see the Kinks on Saturday with him and a mutual friend’s older sister? I don’t remember why the mutual friend (who was more of acquaintance to me) couldn’t go or if he even wanted to go, just that the ticket fell into my lap because of his absence. It’s possible that he was a casualty of the concert having been rescheduled – the show was originally slated for March, but pushed back to May for reasons unknown. In fact, the sister – who was a few years older than us – may have originally intended to attend the March fest with her friends only to see those plans wrecked by the date change. To the night in question: The ride to the Spectrum was far simpler and straighter than the ride to the Tower Theater would be the following week: a straight shot down I-95, off at the proper exit and…there we were, ready to rock. I remember our seats as being first-level, but I doubt they were – and no seating chart that I can find dates back to the early ‘80s. Wherever Section R was, that was us. I do recall we had a good view of the stage, however, and that our section was sparsely filled. Oh, and the sister was annoyed most of the night – not with me, but my friend. According to Doug Hinman’s The Kinks: All Day and All of the Night, the Maryland hard-rock band Kix opened, but I have no memory of them. None. Nada. Zip. What I do remember: the arena going dark, spotlights skipping across the crowd while ambient noise cascaded from the sound system – and then the killer chords of “Around the Dial” spiraling from the suddenly well-lit stage. Ray looked dapper in a sport coat and tie; I’m not sure about the rest of the band. In my desk diary, I noted that the show was “excellent” and referenced “Lola” and “You Really Got Me” as being high points. What else? I picked up Give the People What They Want the week after the concert. It was a great show. August 1978 wasn’t as hot as some months in the Delaware Valley. As this Weather Underground summary shows, the average temperature was 79 degrees, Fahrenheit. It eked into the 90s on nine occasions, topping out at 91, and plummeted into the 60s during seven overnights. It also rained on 14 days, though only two were true soakers – the first brought 1.16 inches and the second brought 2.34 inches. For me, a newly minted teenager (I turned 13 the previous month), that likely meant I spent more days inside than out. In addition to being obsessed about music, I was obsessed with TV – so I survived. I also read a fair bit in those days, so I’m sure I spent a fair chunk of time in my room, stereo on and Stephen King novel in my hand. Hot movies that summer included Grease, Jaws 2, Heaven Can Wait, The Cheap Detective, Hooper and Animal House; I wouldn’t see Animal House for a few years, and have yet to see Jaws 2, but otherwise I saw ‘em all in the theaters. My hometown of Hatboro, Pa., in those days, had its own single-screen movie theater; and the Village Mall in Horsham, which was something of a home away from home, housed a theater with two screens. August 1978 was also the month that Bruce Springsteen & the E Street Band first headlined New York City’s famed Madison Square Garden. In the wider world: The U.S. unemployment rate, as it did for most of the year, hovered around 6 percent, but the wage- and allowance-killer that is inflation continued to threaten the average consumer’s purchasing power. From August to September of that year, inflation was gauged at .76 percent. That may sound like chump change, and in the abstract it is, but the reality is different. The inflation rate for 1978 as a whole clocked in at 7.62 percent, which meant that even with a typical 3-5 percent pay raise, folks ended the year with less spending money in their wallets. 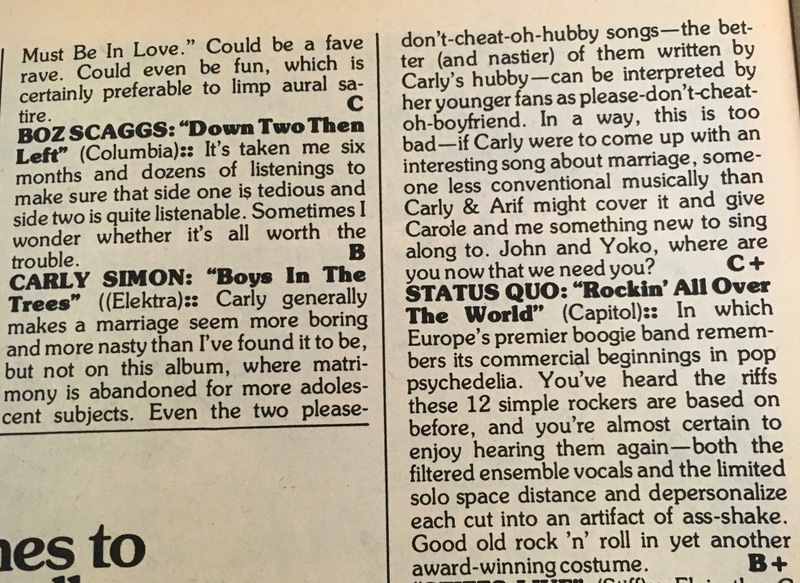 Anyway, enough of the intro – onward to today’s Top 5: August 1978 (via Creem). 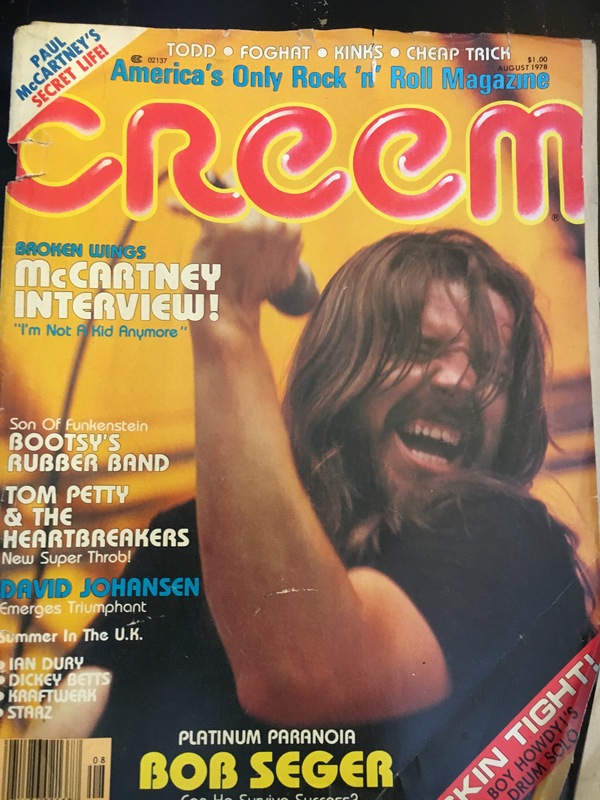 1) Bob Seger & the Silver Bullet Band – “Hollywood Nights.” Bob Seger graces the cover of this issue of Creem. 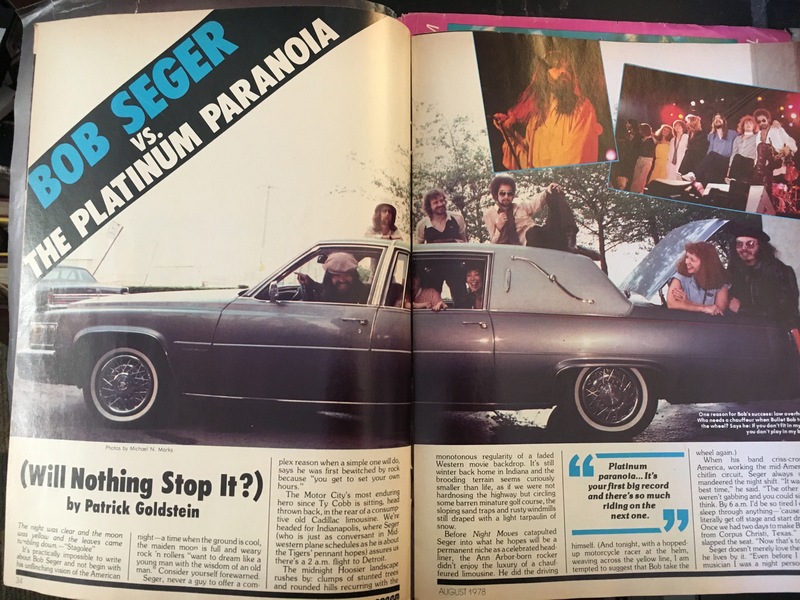 There’s an excellent, in-depth article written by one Patrick Goldstein about him, his entry into the big time with Night Moves, and his new album, Stranger in Town. “[It] was actually finished last November, but then, at the last minute, we scrapped it ‘cause it just didn’t feel right,” Seger explains. An excerpt: “If there was ever a decade custom-made for the survival of the fittest, it is the ‘70s. It’s not a time for heroes, but for mood jewelry and digital watches. The most inspiring rock albums of the decade, Seger’s Night Moves, Springsteen’s Born to Run and Graham Parker’s Howlin’ Wind, sensing this bleak state of affairs, have turned their back on the present, preferring to explore remembrances of things past. 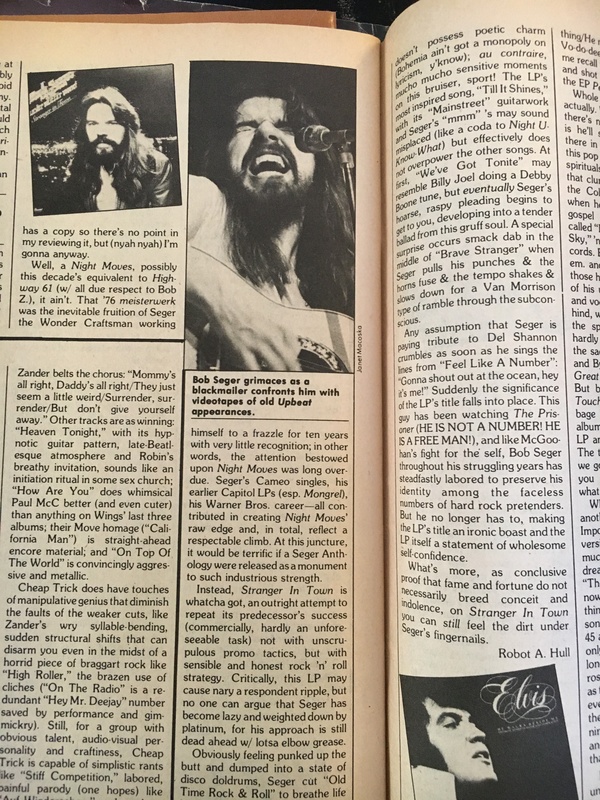 “Hollywood Nights,” the song I’ve chosen to feature here, is one of my favorite Seger numbers – written, the article informs us, while he was in L.A. mixing Stranger in Town and hanging out with longtime friend (and onetime backup singer) Glenn Frey. It’s a great song for driving. CREEM: If anything, there’s a subtle psychedelic undercurrent on many cuts. Some of the arrangements can be traced back to Sgt. Pepper and the White Album. McCARTNEY: I suppose we were going for that kind of feel by doing more complex arrangements but I’m not about to analyze it. Next time around we’ll go for a bit more sweat. Really, it’s down to writing sweaty numbers and, believe me, they’re the hardest of the lot to write. 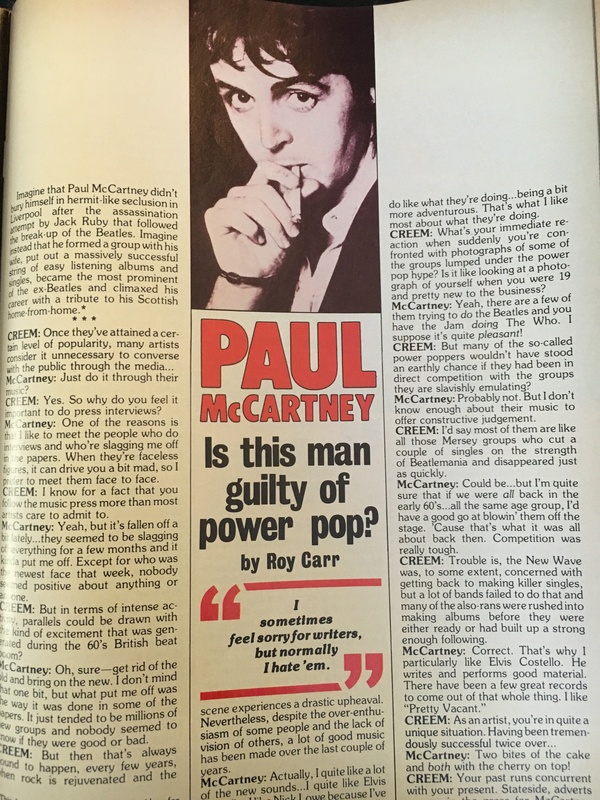 The whimsical title track is one of the songs with the “subtle psychedelic undercurrent” that Roy Carr refers to, I think. His opinion notwithstanding, “You Belong to Me” is a good-great song. Written by Carly and Michael McDonald, it was first recorded by the Doobie Brothers on their 1977 Livin’ on a Fault Line album, released as a single and stalled out on the charts at No. 79. 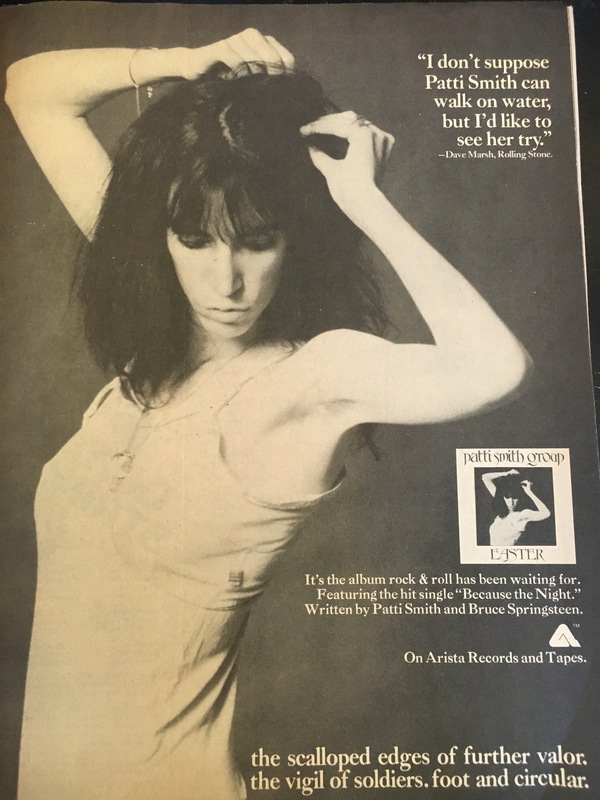 A year later, Carly released her own rendition, which hit No. 6. 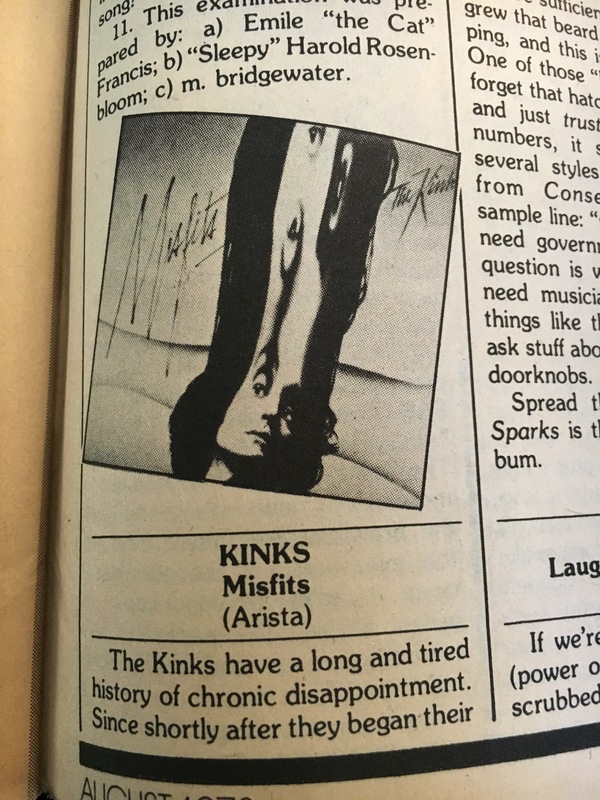 Granted, Misfits is far from a five-star album, but – to my ears, at any rate – the title cut and “Rock & Roll Fantasy” are great songs.